This is an incredible new sequel to a children's classic read. I haven't read The Secret Garden by Frances Hodgson Burnett since I was little. 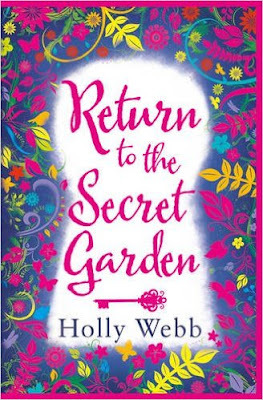 It's a story which grew on me as I got older, and while not one of my favourites I was curious about the sequel simply because Holly wrote it! Holly's books are always amazing, so I thought I'd give it a go. I'm so glad I did! While I can't remember the exact style of the first book, the way the story made me feel was similar to my memories of book 1. Through various events I learnt/re-remembered what happened to Mary Lennox through Emmie's discovery of her diaries and by learning about it from other people. Emmie is a lovable character. I'm not surprised she was upset about leaving her cat: having a cat of my own I was distraught by the separation. There's a particular character's kindness who helps ease Emmie's distress which was touching, and in keeping with Holly's style of writing. Emmie causes a bit of hassle for staff at the manor, but she also helps Mrs Craven see life differently. I know the garden is important – it certainly features a lot for Emmie, but what stuck with me was the heartache that so many went through during the second world war. There's the obvious human fatalities and worry that loved ones won't come home, and like Emmie many would have had to abandon their pets. That's what I cried the most over, imagining just how many tight bonds were broken and never reunited with each other. I can't say how but while I cried a lot at the end they were tears of happiness for Emmie and those whose lives she affected. A feel good read for sure, one to make you feel grateful for what you have, as well as one needing tissues during and chocolate after reading!